Ribbed rubber grip. Removable cap with a white eraser. 7mm, #2 lead included. Funky, mechanical pencil with loads of possibilities. Full-color, full-barrel artwork. FREE stock backgrounds available. 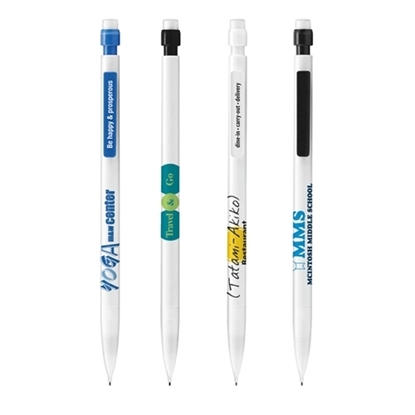 Scantron-certified*Lead: Includes Three .7mm #2 Graphite Leads. Comfortable contoured gripping section. 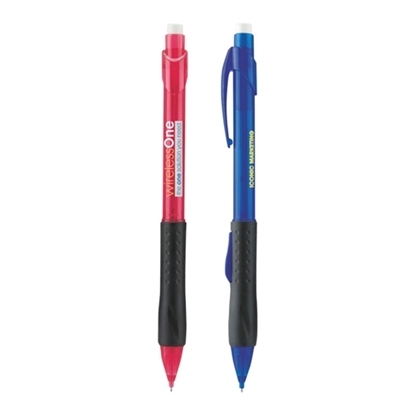 Provides a write-out equivalent to 2 1/2 woodcase pencils. Scantron-certified*. 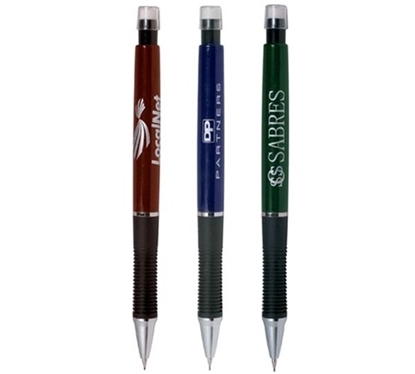 2 colors available on barrel, 1 color on clip.Lead: Includes Three .7mm #2 Graphite Leads. Side lead-advance mechanism. Smooth, dark line. Textured rubber grip for comfort and control. Eraser-end. Scantron-certified*. 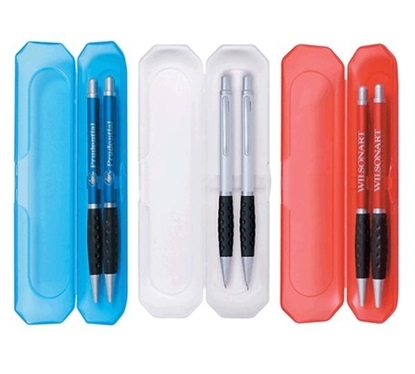 Solid Black, Solid White, Translucent Blue, Translucent Red.4 imprint colors available on barrel, 1 color on clip. 1-color imprint only on barrel with clip imprint. Lead: Includes Three .7mm #2 Graphite Leads. 2 tone color can holder. 1/8" thick high-density open-cell Scuba Foam with contrasting accent panel on 1 side. Collapsible. Fits most cans or bottles. Choose the main body from 24 colors of material, then choose the accent panel color. 3 5/8" W x 5" H x 1/8" Thick. 3-in-1 multi-functional application. Switches from a red ballpoint pen to a black ballpoint pen to a .5mm mechanical pencil with a simple twist. Solid Gray, Translucent Green, Translucent Blue. 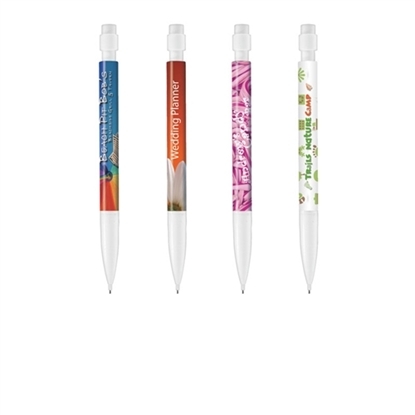 Pens include frosted clear cap and grip. 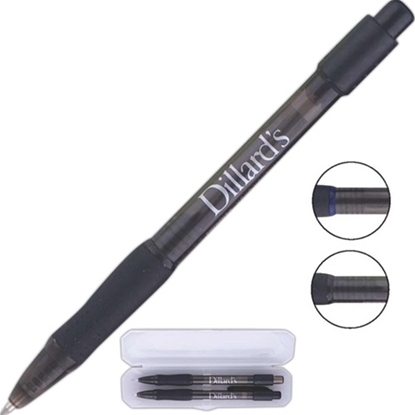 Solid gray pen includes a black grip. 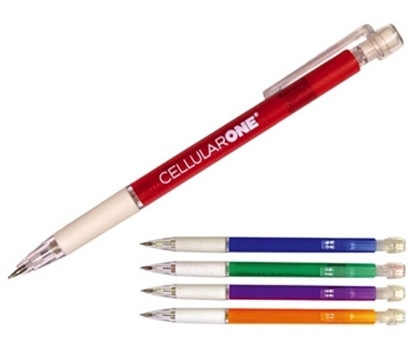 Sleek and stylish ballpoint pen, 0.5mm lead pencil, stylus PDA point and orange fluorescent pen. 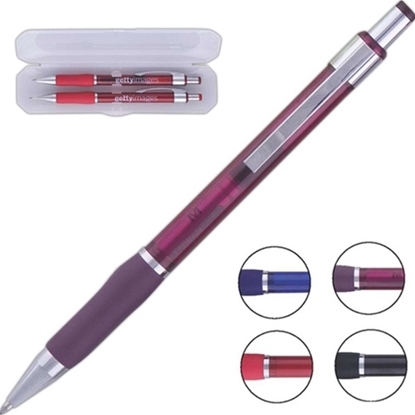 Amazing 4 in 1 pen. Guaranteed 2 year shelf life for ink. Striking silver accents. Rich black oxidized imprint. Each pen is individually cellophaned. 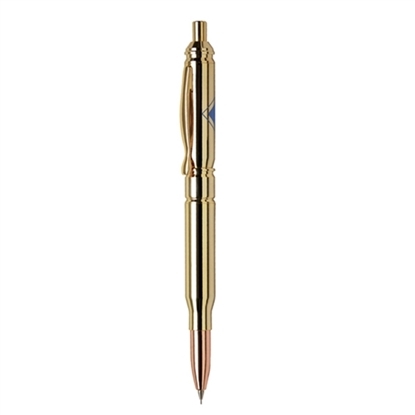 The Bullet Pencil is click action pencil. It has solid brass construction and a polished gold plate finish with copper color points. 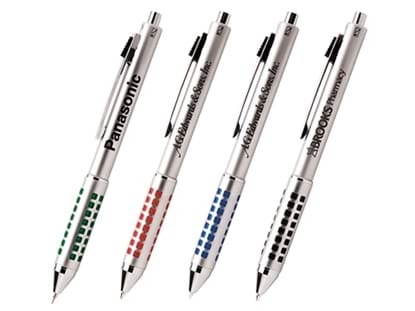 These are very nice metal mechanical promotional pencils. Multiple imprint locations. Adult 100% preshrunk ComfortSoft® cotton tagless T-Shirt. Double-needle coverseamed neck taped shoulder-to-shoulder. All the comfort of Hanes famous tag-free collar. Short-sleeve tee is preshrunk and resists shrinking and fading. Shoulder-to-shoulder tape for durability. Enjoy the Hanes Lay Flat Collar Guarantee! Appropriate for any occasion, the Paper Mate Lexicon is the perfect business gift. With three distinctive finishes to choose from, it is easy to select a Lexicon that will appeal to everyone on your list. The Paper Mate Lexicon. Designed with everyone's writing style in mind. Chrome plated clip and trim. 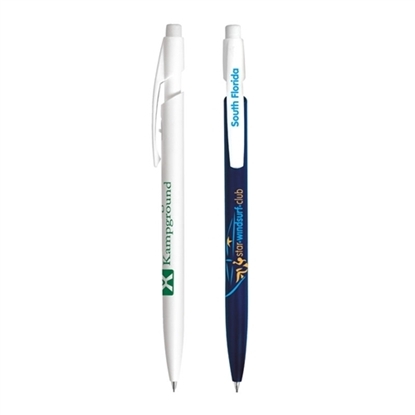 Mypromotionalpens.com offers the largest and best priced selection in Promotional Mechanical Pencils. We will price compete and we won't be under sold. 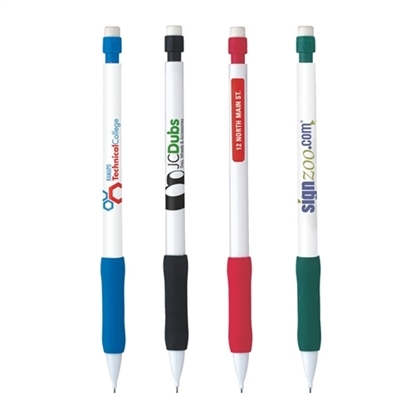 Let our graphic designers make your personalized Mechanical Pencils standout above the crowd at no charge. We won't stop until you are completely satisfied with your custom Mechanical Pencils art proof.Use category search filters on your left to help narrow your search to find exactly what you are looking for.